HOW DO I IMPROVE MY FIELD HOCKEY FITNESS? Field Hockey is unique in that it requires mental toughness, upper & lower body strength, flexibility, agility, and incredible running skills. Showing up at practice may make you part of the team, but if you want to be the best player you can be you'll want to stay fit on your own and practice on your own. A key to performing in field hockey is running--running well since most of the game is spent in motion, especially for forward players. If you're out of shape, an hour or more of running can be grueling - if you are in shape great! But are you used to running fast for an hour? 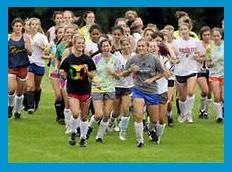 To be ready for Field Hockey, mix both long-distance running for endurance and sprinting for speed and quickness. It is important to have excellent endurance when running, and to be able to push one's body to great speeds. Field Hockey demands players vary speed and change one's path sporadically. It's best to train how the game is played! Changing directions and being able to maneuver quickly around other players is key skill in Field Hockey. Players need to be flexible and agile. Increasing one's flexibility helps to and maintain stability and balance, which is also important for injury prevention. Yoga and simple stretches are great for increasing flexibility, but always check with a physician before beginning a new exercise routine. Agility, the ability to rapidly change the body’s momentum from one direction to another, can be enhanced through drills that that require quick and precise movements. Common agility drills are: grapevines, ladder drills, lateral sprints, and hill climbs. Being flexible and agile is great, but make sure you can integrate speed, flexibility, and agility with the actual skill. Field Hockey fitness is all about perfecting a move in order to make it happen rather than just remember it--it must become an automatic reaction. Upper body strength is important whether a player is powering through an opponent, driving the ball, or simply pushing the ball out from another player's stick. 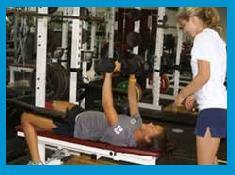 Playing Field Hockey will help build muscle to the upper body, but working with weights will definitely help. Working with weights will also help to strengthen parts of the body players use, but find hard to strengthen, or may not know need strengthened, such as certain back muscles. Before you begin lifting weights, work with a professional and pay attention to your own body, then develop a play to strengthen your weaknesses. That is a smart way to improve field hockey fitness.